I couldn't post about the kitchen floor earlier, because I couldn't find the Cat. It's heard that I'm looking for something starting with C.
I Cornered it at last. I decided on terracotta, with slate accent tiles, to finish the floor of the kitchen. This part of the dollhouse happened effortlessly, and I'm very pleased with the result. There were a few ideas for things I knew that I wanted in the kitchen, and had saved on my Pinterest Board. This is Marion's kitchen. In her build of the Del Prado house, she added a false wall and turned the stove at an angle. This makes the kitchen so much more interesting. I simply had to have that too! I wanted my stove to stand at a slightly raised level. This was often done in old houses. You can see where I marked the space for the stove, and glued a piece of card stock to the floor to raise the level. If I was going to go to all the trouble of making individual tiles, I wanted an interesting layout on the floor, with accent tiles. To help with the layout, I drew a grid on the floor. Then I went ahead and made lots and lots and lots of little terracotta tiles, using polymer clay. I started with a block of basic SculpeyIII terracotta colour, and rolled the softened clay to a thickness of about 1.5mm with a pasta machine. I happened to have a little 11mm square cutter in my stash, an impulse buy at a cake decorating shop. I was very glad when I found it. I pressed out the tiles directly on to a ceramic tile, then lifted away the waste clay, and baked the little tiles directly on the ceramic tile. That way they stayed nice and flat. Every time I rolled out a new sheet of clay, I added a little bit of scrap clay, either light brown, or black, so that the colour of the terracotta tiles would have slight variation, just like real tiles. Whenever the clay rolled out unevenly, or there was a fold line in the clay, I left it like that. It all adds texture and realism. I didn't have a cutter for the slate tiles, I just cut those by hand. I mixed black and white clay to make a really dark grey, then added silver glitter eyeshadow to give it a bit of sparkle. It shows up as white spots in the photo, but in real life it looks beautiful. In this close-up view you can see that the tiles are quite uneven in size. Real life slate tiles would be cut by hand, and would have slightly uneven sides too. I decided that I would have a round of terracotta tiles, followed by a round of slate, as a border around the room. Then I would fill the inside with tiles laid diagonally across the floor. I started gluing the tiles in an L shape, and used a scrap of card to align them before the glue set. With each new row of tiles, I added an L inside the previous one. This helped me to keep the spaces even. Completed floor. Where the stove is going to be, I used slate tiles, and made a herringbone pattern. If you are curious about what needs to sit on that square of raised black slate, this is what I have. I constructed the kitchen range and its surround years ago during my first attempt at the house. Now that I've seen Studio E's incredible recently completed stove and hood, I realize that I have a huge challenge ahead of me to make this look better! I let the glue set for a day before I started grouting. The grout was an accidental discovery. A while ago I bought what I thought was pre-mixed crack filler in a plastic bucket to fix up some spots in the studio wall where I took a shelf down. I must have been looking for the cheapest bucket, and not paying attention to the labels. When I opened it, I discovered that the contents was slippery and runny. The bucket says it is plaster skim. 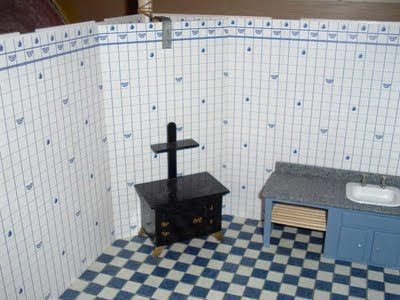 I have no idea what one would use it for, but it makes lovely dollhouse grout. None of the grittiness of crack filler, and it has a slightly gluey texture which helps it to adhere. I mixed black acrylic paint into the mixture to make grey. Rubbed it into the tiles with my finger and let it set for a few minutes. Then rub away the excess grout with a damp rag, using small circular movements, so as not to remove the grout from between the tiles. When the grout had completely set, I used a dry cotton rag to put a gloss on the floor. Polymer clay buffs to a lovely shine without the need to apply any kind of varnish or sealer. So there's another floor finished. I'm tempted to try using polymer clay to create old fashioned patterned linoleum to use in the attic rooms. Happily, I've also figured out the perfect colour scheme for the interior. I'm nearly finished with the master bedroom walls, and the colours make my heart sing. But I will keep you in suspense over my choices, and how I came to them, for a little while! Thank you! I keep looking at it as I walk past. Can't wait to carry on with this kitchen. It's exquisitely rustic and I love it's color variations. The border and angled patterns make it so lively and interesting. It also looks like it was so much fun to do! Can't wait to see the color post! Thank you, Jodi! My dollhouse building skills are sadly lacking, but I am blessed with an ability to distinguish colours, and to match them up in polymer clay or paint. Having such strong connections to colour is not always good, the fights my husband and I have had over 'is the couch red or pink'! Absolutely lovely! I admire your straight lines, I'm positive I couldn't pull that off as well. Your work always looks so neat to me, Keli! I'm amazed. Looks absolutely gorgeous. Your border is perfect. Thank you! Had a few head scratching moments to figure out what to do on the edges and corners. Fortunately polymer clay is very easy to cut! Nonsense! Yours is going to be very different from mine, and in many ways probably better. Just jump in there and follow your heart. I'm enjoying this build so much. Thank you dear Rosa, you have a good weekend too! Thank you Sam, I'm having heaps of fun with this! Hugs, Elizabeth. I'm going to make black and white tiles for the bathroom floor, I think. One of the best things about polymer clay tiles is that one can cut them with scissors. If you have distorted walls, like I do, or lots of corners, it's easy to cut the tiles to fit. Every time I look at your house, I sigh. I will need many hundreds of little things to fill the rooms... there is a lot of improvisation and making of things in my future! Your floor looks great Megan! I will go look for those tubs of plaster skim. I like your idea of linoleum floors. Looking forward to seeing your interior decorating, I am sure it is going to be beautiful! Thank you Elga. There is a way to transfer pictures on to polymer clay. I've done it with great success in the past. I see real possibilities for linoleum tile blocks. You are so right Pepper. Miniaturists look at everything with different eyes. Thank you for liking my floor! Wow, that´s a floor!! So much work but totally worth it. The result is beautiful and just perfect! Megan, this is an amazing kitchen floor!! It looks so realistic, and with nice color variations. The border and angled patterns finish the whole lively and interesting. Thank you for showing how you did it! I'm always taking things home 'in case' Birgit. Then I'm so pleased when I do a project and I find something useful in my stash! I'm very impatient to place the stove down against its angled wall, but there is a lot of work to do on the house before I get there. I look forward to seeing what you make!